Archaeologist Benjamas is running for her life after investigating the mysterious Crocodile's Underground City. The city has N chambers. There are M bidirectional corridors, each connecting a different pair of distinct chambers. Running through different corridors may require different amounts of time. Only K of the N chambers are exit chambers that allow her to escape. Benjamas starts in chamber 0. She wants to reach an exit chamber as quickly as possible. The Crocodile gatekeeper wants to prevent Benjamas from escaping. From his den, he controls secret doors that can block any single corridor. That is, whenever he blocks a new corridor, the previously blocked one has to be reopened. Benjamas's situation can be described as follows: Each time she tries to leave a chamber, the Crocodile gatekeeper may choose to block one of the corridors adjacent to it. Benjamas then chooses and follows one of the unblocked corridors to the next chamber. Once Benjamas enters a corridor, the Crocodile gatekeeper may not block it until Benjamas reaches the other end. Once she enters the next chamber, the gatekeeper may again choose to block one of the outgoing corridors (possibly the corridor that Benjamas just followed), and so on. "If you ever reach chamber A, take the corridor leading to chamber B. However, if that corridor is blocked, then take the corridor leading to chamber C."
"Don't bother about chamber A; according to this escape plan you cannot possibly reach it." Note that in some cases (for example, if your plan directs Benjamas to run in a cycle) the gatekeeper may be able to prevent Benjamas from reaching an exit. An escape plan is good if Benjamas is guaranteed to reach an exit chamber after a finite amount of time, regardless of what the gatekeeper does. For a good escape plan, let T be the smallest time such that after time T, Benjamas is guaranteed to reach an exit. In that case, we say that the good escape plan takes time T.
N — the number of chambers. The chambers are numbered 0 through N-1. M — the number of corridors. The corridors are numbered 0 through M-1. R — a two-dimensional array representing the corridors. For 0 ≤ i < M, corridor i connects two distinct chambers R[i] and R[i]. No two trails join the same pair of chambers. 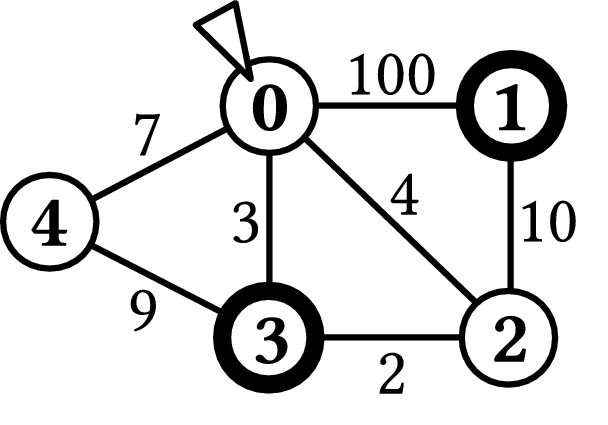 L — a one-dimensional array of integers containing the times needed to traverse the corridors. For 0 ≤ i < M, the value 1 ≤ L[i] ≤ 1 000 000 000 is the time Benjamas needs to runthrough the ith corridor. K — the number of exit chambers. You may assume that 1 ≤ K ≤ N.
P — a one-dimensional array of integers with K distinct entries describing the exit chambers. For 0 ≤ i < K, the value P[i] is the number of the ith exit chamber. Chamber 0 will never be one of the exit chambers. Your program must output the smallest time T for which there exists a good escape plan that takes time T. You may assume that each non-exit chamber will have at least two corridors leaving it. You may also assume that in each test case there is a good escape plan for which T ≤ 1 000 000 000. If you ever reach chamber 0, take the corridor leading to chamber 1. However, if that corridor is blocked, then take the corridor leading to chamber 2. If you ever reach chamber 2, take the corridor leading to chamber 3. However, if that corridor is blocked, then take the corridor leading to chamber 4. In the worst case, Benjamas will reach an exit chamber in 7 units of time. Hence, your program should output 7. If you ever reach chamber 0, take the corridor leading to chamber 3. However, if that corridor is blocked, then take the corridor leading to chamber 2. If you ever reach chamber 2, take the corridor leading to chamber 3. However, if that corridor is blocked, then take the corridor leading to chamber 1. Don't bother about chamber 4; according to this escape plan you cannot possibly reach it. Benjamas will reach one of the exit chambers no later than after 14 units of time. Therefore, your program should output 14. Lines 2 to M+1: For 0 ≤ i < M, line i+2 contains R[i], R[i], and L[i], separated by a space. Line M+2: a list of K integers P, P, …, P[K-1], separated by a space. One integer - the expected solution. 3 ≤ N ≤ 1 000. The underground city is a tree. 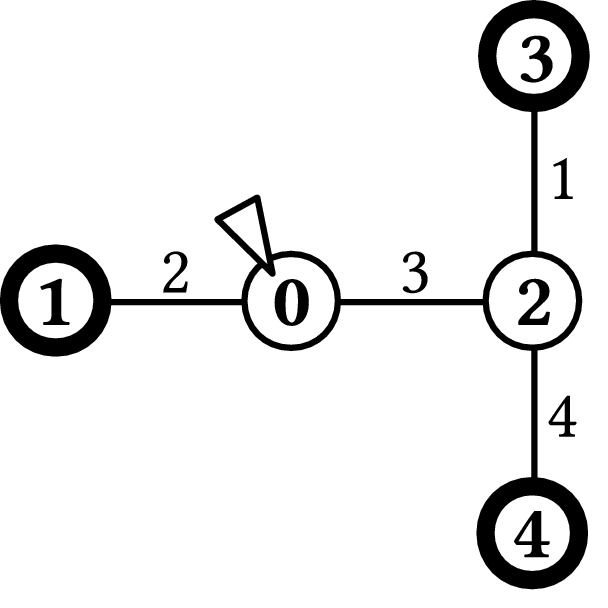 That is, M = N-1 and for each pair of chambers i and j there is a sequence of corridors connecting i and j. Every exit chamber is connected to exactly one other chamber. Any other chamber is connected directly to three or more other chambers. 2 ≤ M ≤ 100 000. 3 ≤ N ≤ 100 000. 2 ≤ M ≤ 1 000 000. My program is experiencing a NoSuchElementException for almost all the test cases. I could not understand what was wrong. I submitted my program to CodeChef for this same problem and it received AC for most of the test cases (aside from 3 TLE's). I was unable to figure out why I was receiving RE here. Please help me out. Thank you very much. Your help is greatly appreciated. The input format is misstated. I apologise for the inconvenience. Please assume the following instead. We will change either the problem description or the test files to fix this eventually. Lines 2 to [b]M[/b]+1: For [b]0 ≤ i < M[/b], line [b]i[/b]+2 contains [b]R[i][/b], [b]R[i][/b], and [b]L[i][/b], separated by a space. Lines [b]M[/b]+2 to [b]M[/b]+[b]K[/b]+1: For [b]0 ≤ j < K[/b], line [b]M[/b]+2+[b]j[/b] contains [b]P[j][/b]. Lines M+2 to M+K+1: For 0 ≤ j < K, line M+2+j contains P[j]. ImbaCalvin on May 21, 2015 - 8:08:05 pm UTC Typo? Alex on May 25, 2015 - 8:04:54 pm UTC Re: Typo?